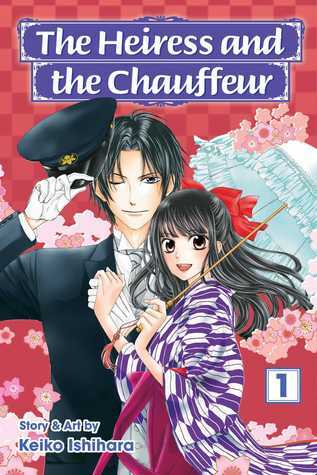 Today’s post is on The Heiress and The Chauffeur volume 1 by Keiko Ishihara. It is the first in a duology. It is 192 pages long and is published by Shojo Beat. The cover has the two main characters on it looking at the reader. The story is told from third person close of the two main characters moving one to the other as the story goes. The intended reader is someone who likes cute shojo stories, historical romance, and pretty art. There is no foul language, no sexuality, and very mild violence in this volume. There Be Spoilers Ahead. From the back of the book- At an all-girls school during the Taisho era in Japan, rumors swirl that heiress Sayaka Yoshimura is having a forbidden love affair with her chauffeur, Shinobu Narutaki! Sayaka scoffs at the rumors, but could a romance between master and servant actually be brewing? Review- This is a very cute story. Sayaka is a cute heroine and Shinobu is very sweet. They were friends as children and now they are young adults with all the expectations of that on them. The stories in this volume are mostly about Shinobu being seen as less than because he is servant and is from a poor background. Sayaka is very modern because she believes that people are not where they come from or how much money they have. So she gets into trouble with her opinions but she gets rescued by Shinobu a lot. But it is a very sweet, cute story and I look forward to the next volume with them. I give this volume a Five out of Five stars. I get nothing for my review and I bought this manga with my own money.